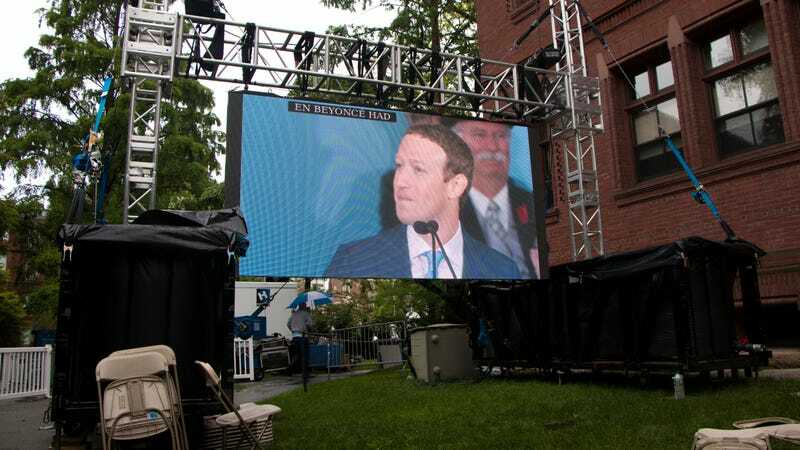 Facebook founder and domestic travel enthusiast Mark Zuckerberg pretended to be a politician at his Harvard commencement address on Thursday afternoon. Not many people showed up, probably because it was cold and rainy and generally miserable outside. Not even Facebook can control the weather. The speech sounded like a political one, because it was. The basic principle that Zuckerberg shared with the class of 2017: Everyone in the world should have a “sense of purpose.” (Sure.) And Zuck’s been trying to figure out what that means himself. Over the last several weeks, Zuckerberg has been traveling to cities around the country in a pseudo-campaign that he says he organized solely to “get a broader perspective” about the fellow humans who use his website. But Zuckerberg seemed sincere. His speech was coached, and he did a great job, despite the fact that an audience of just a few hundred people were standing ankle deep in mud and doing their best not to catch hypothermia. Towards the end of his speech, Zuckerberg cried a little while talking about a student he mentored through the Boys and Girls Club. The crowd was silent, as he collected himself. But when Zuckerberg gave his final congratulations and one last send off to the Harvard Class of 2017, the people cheered. Mark smiled, chin held high, and the rain kept falling down.